Do you experience turbocharger problem recently? do you think the problem is caused by material defect or other cause? or do you think that problem is too early to come? the main cause of turbocharger failure is because of the driver or operator habit. the have a belief, that to make the battery fully charged and be ready for the next start is to increase engine ROM just before they turn it off. the problem is, when the engine runs very fast, so does the turbocharger. it needs lubrication as engine does. but when the engine is turned off, the lub system also stops working, leaving the turbocharger running in high speed without lubrication. turbocharger failure also will affect engine performance, since when the blades hit the housing, some grams will go into cylinders and causing more fatal damage to engine. in the other situation, sometimes the operator waits for the chance to get his bucket filled with materials in the site. waiting for so long will make engine running in low idle speed that creates a lot of fuel waste and high concentration of dangerous toxic in exhaust gas. to handle this conditions, we create a device that solve the problem. 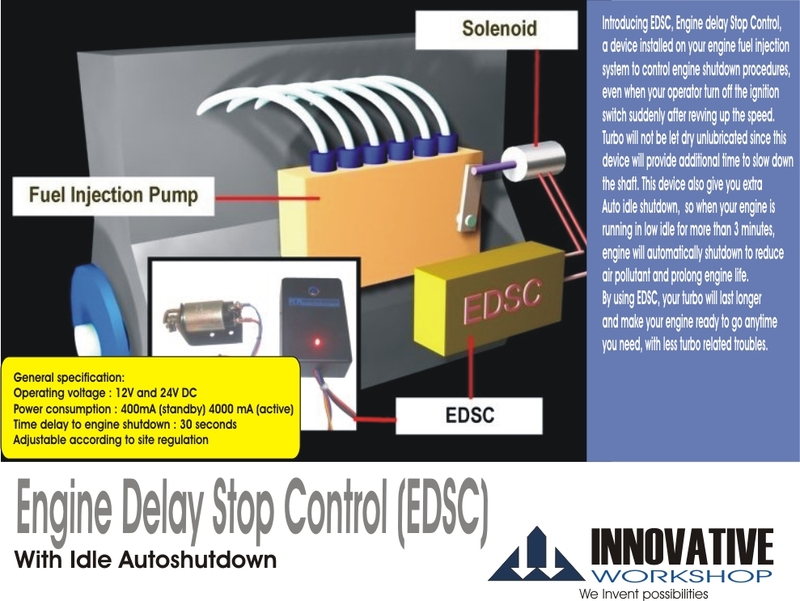 Engine Delay Stop Control (EDSC), that will maintain engine in low idle when the driver or operator turn off the ignition switch, for 30 seconds to wait for the turbo to slowdown to get enough time for lub, and this device also able to turn off the engine while waiting for the haul.